Happy National Pizza Day! Get ready because we’ve got an extra-special recipe that’s dog-friendly, so you can share this momentous occasion with your pup. This recipe makes about 12 “dog” pizzas per boule of dough. Remember that moderation is key to healthy pups, and these treats are fairly decadent. We like to pass them out to friends’ and neighbors’ dogs so our own dogs don’t end up eating them all! For dogs who can tolerate poultry, we baked a 4 strips of turkey bacon at 400°F for 10 minutes. Remove and cool, then crumble or chop into small pieces. We used homemade dough with the salt and sugar reduced (since our dogs don’t really need extra salt and sugar for taste, it is only used to help the yeast rise). Put the warm water in a small bowl, sprinkle the yeast and let sit for 15min to activate. After 15min, add the olive oil. Meanwhile, in a medium to large sized bowl, whisk together flour, salt and sugar. Add the warm water/yeast/olive oil to the dry ingredients bowl. Begin to knead by pinching, mimicking the look of a dough hook machine with your hands. If the dough seems dry, give it some time, it will release more moisture as you knead it. If the dough is too wet, add a tbsp of flour at a time early on in the kneading process. After the ingredients have thoroughly mixed, begin to knead properly and pulling the dough around itself until you have a big ball of dough. Put the big ball in a lightly olive-oiled stainless steel or glass bowl. Cover with plastic wrap or foil, and keep in the fridge for 12 hrs (up to 16). Overnight does the trick pretty well. After it’s risen overnight, you’re going to take the dough and let it warm up to room temp for about 30 minutes. Proceed to knead again, then divide into 4 even quarters. Shape those into their own smaller balls (boules). You can take the extra dough boules and freeze them at this stage. For dough to use immediately, the next step is to lightly brush it with olive oil, cover with plastic wrap, and let them rise again until it doubles in size. What about store-bought dough? 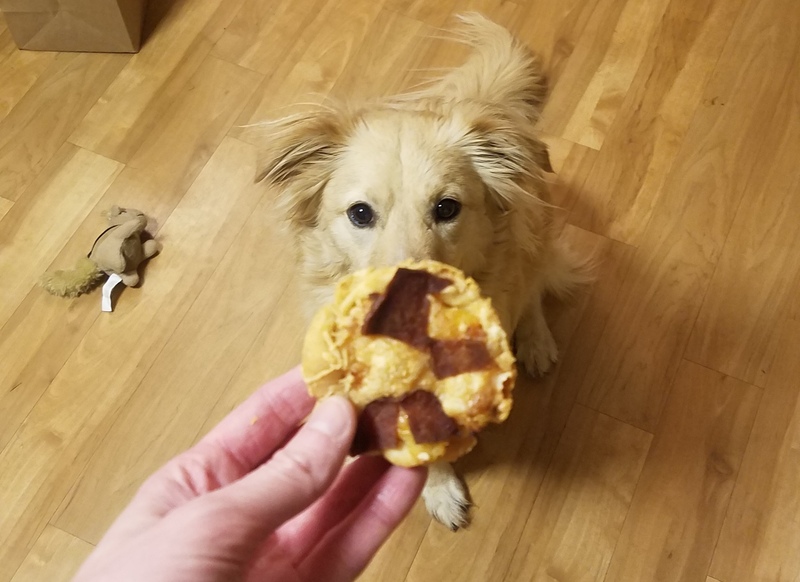 Dough bought from the store may be fine; the difference is that you won’t know how much salt or sugar is in it, but if these are rarely-given treats (and your dog doesn’t have a health condition), it shouldn’t be a problem. Tip: If a dog scarfs down uncooked dough, you may need to head to the vet. It can expand in the stomach causing complications like bloat, or even lead to alcohol poisoning. Find out more from the Pet Poison Helpline – Bread Dough entry. Begin to knead dough and smooth out with a rolling pin. You’ll need to shape it (or cut) to the desired size. For larger dogs, baking the dough in a muffin tin works great; for small mouths, try a mini-muffin tin. You will have to brush the tin with olive oil or use cupcake liners. You can also make individual pizzas and cook on a stone as well. After shaping, top with a layer of the plain sweet potato mash or applesauce. Then, simply sprinkle with a small amount of mozzarella and the turkey bacon. Bake at 450°F for 25 minutes. If not done, put ’em back in for 5 minutes. Cool completely before serving. CAN DOGS EAT HUMAN PIZZA? Oh how they wish they could! Dogs should not have garlic, onions, or tomato sauces and most pizza is very fattening with an excess of cheese. If you catch your pup eating a slice of human-grade pizza, you may end up with a sick pup. If you catch your pup after having eaten a whole, entire pizza, call your vet immediately as it could result in pancreatitis. We love our pets like family because they are family! 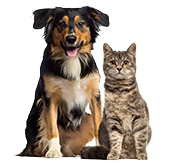 Knowing and recognizing the symptoms of common injuries and illnesses helps to prepare a pet parent, and signing up to protect your pet with pet health insurance is one of the best things you can do (both for your pet and for your wallet!). Start by getting a free quote today.